From the makers of Kwik Stix comes a new product: Thin Stix! Last year I reviewed the Kwik Stix from The Pencil Grip, Inc. Today I am happy to share with you a new favorite product in the form of Thin Stix, 12 pack. 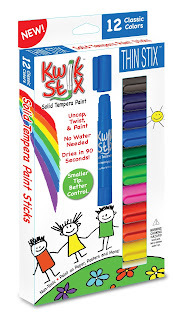 Thin Stix are a solid tempera paint, just like the original Kwik Stix. The difference is that they are THIN. It makes for more flexibility with projects. They write with the same smooth consistency and are just as fun to use! I like these for all the same reasons I love the originals. 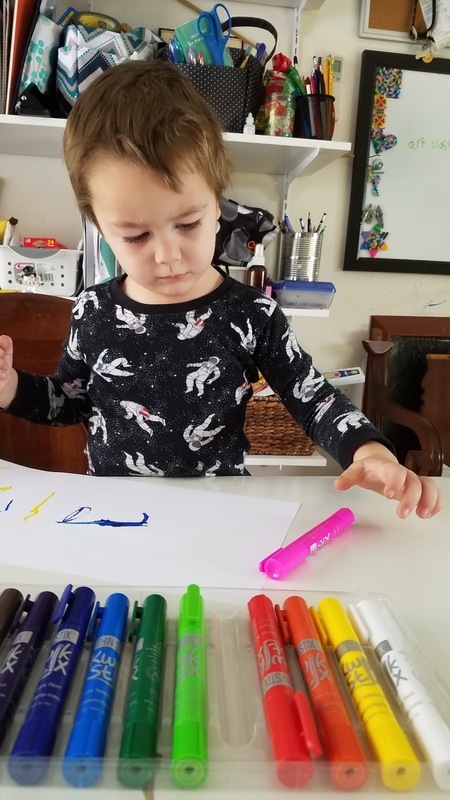 They are easy to use, easy to clean up, fun, and inspire creativity in my children. The 2 year old can use them as easily as the 9 year old! The colors are bright and don't fade over time. The clean up is easy and I haven't come across any staining on the furniture or clothes. As soon as we got out Thin Stix in the mail, the kids begged to play with them. We used them for free creative art as well as using them in our art curriculum during school time. Here are a few pictures of some of the work we did with the Thin Stix. 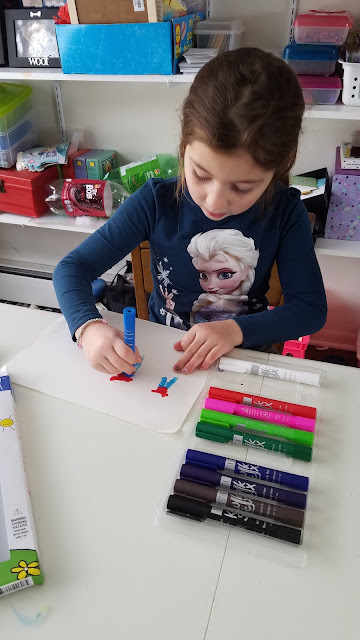 Kaelyn was working on an art project for school. This is Kaelyn's completed art project. 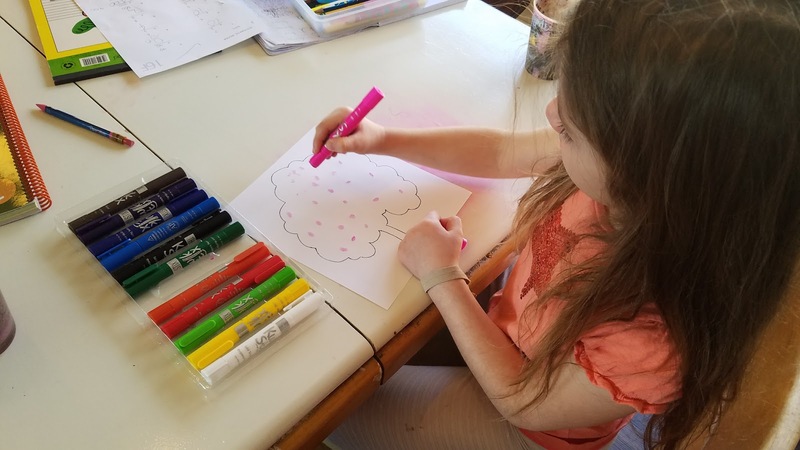 She used the Thin Stix to make flowers on her tree and the small stick was able to do a great job with it! 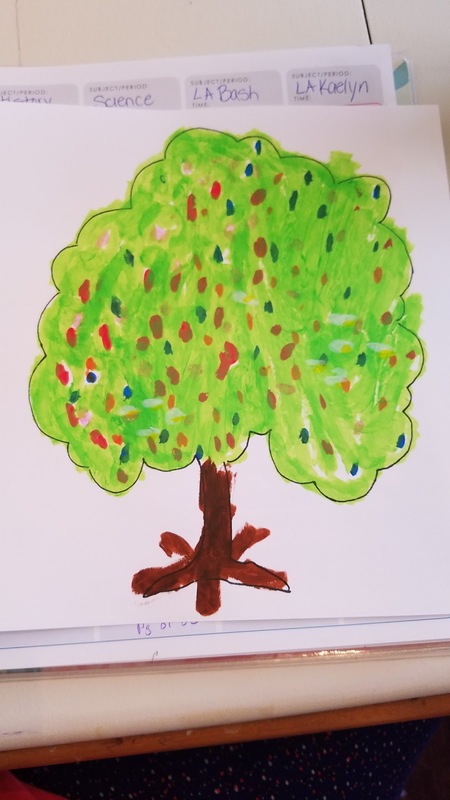 Art is one of our favorite subjects in this house and we enjoy using a variety of mediums when completing projects. 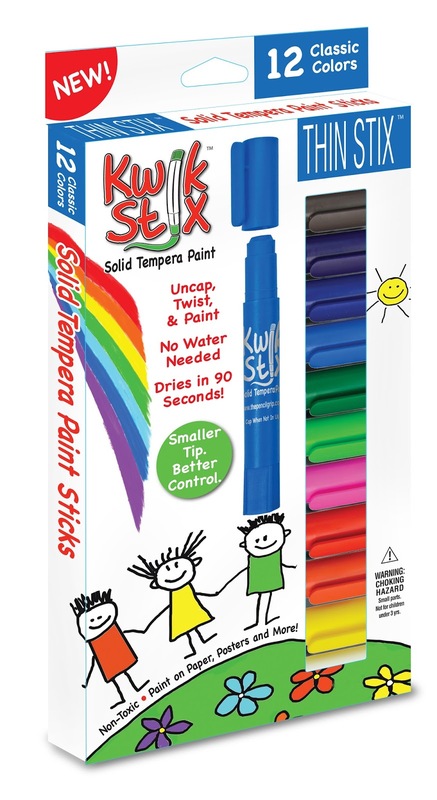 I can attest that my kids tend to pick the Kwik Stix and Thin Stix most often when given a choice of which medium to use. I am glad for it because it is much easier to use than liquid paint and doesn't make a mess. The resulting art is vivid and looks as if it was painted with liquid paints but without a runny mess. Miles loves to use them too! 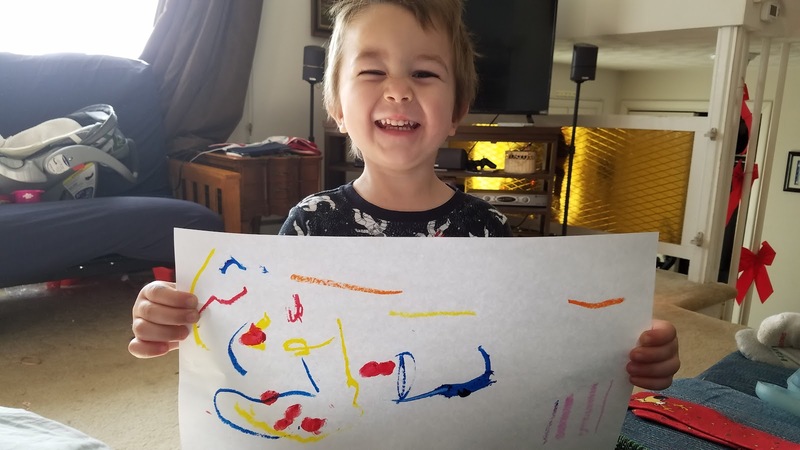 Honestly, they are his favorite medium when doing art projects. These are perfect for my toddler. He can draw and "paint" with the older kids and not make a huge mess. He LOVES it. He can open and close the sticks without much difficulty. Before putting them away I do a once over and make sure the caps are snapped shut because a few are sometimes not closed completely. Here you can see the difference between the original Kwik Stix (top) and the new Thin Stix (bottom). 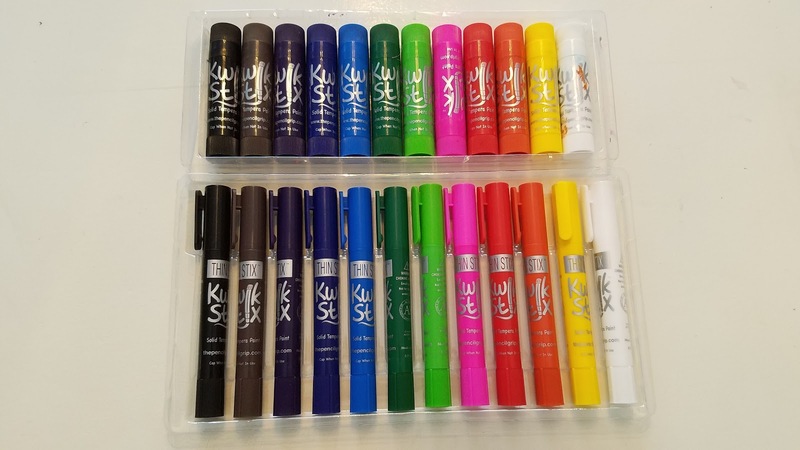 You can easily find them on Amazon (with FREE shipping if you have Prime) in a variety of types: classic colors, neon colors, metallic colors, 12 packs, 24 packs, and more! Most of the packs are less than $10 right now. I have a few waiting in a shopping cart to buy for Easter baskets because these are winners in my house. *Disclaimer: I was provided with a free product in return for my honest review. All thoughts and opinions are my own and not influenced by the developing company and/or its affiliates in any way.